1. Famous novelist “Yashpal” belongs to which district? 2. Who is the writer of story “Usne Kaha tha”? 3. Who is the writer of the book “Twarikh-e-Riyasat Sirmaur”? 4. The writer of the book “Himalayan Art” is? 5. Who is the writer of the book “Himalayan Circuit”? 6. “Prachin Himachal” is written by? 7. Who is the author of the book “Indian Painting from the Punjab Hill”? 8. Who is the author of the book “Himalayan Pilgrimage”? 9. Which Shimla Hill’s Princely State court poet is the writer of “Sashi Vansh Vinod”? 10. Who has written the book “Muktsar Twarikh-e-Riyasat Chamba”? 11. “Kinner Desh” is authored by which of the following? 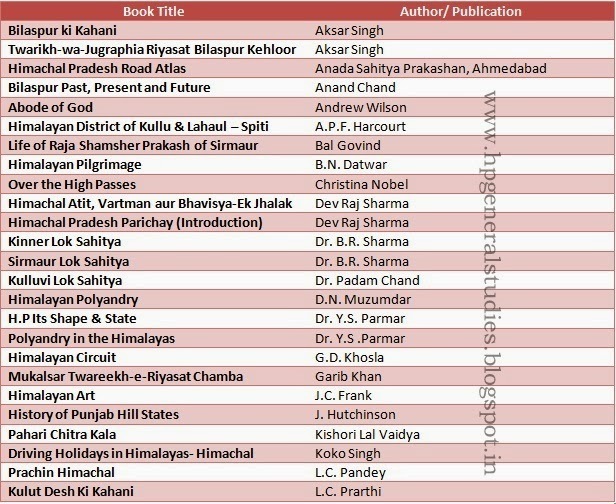 12. Who is the writer of the book “Himalayan District of Kullu and Lahaul-Spiti”? Answers: 1-c, 2-b, 3-c, 4-d, 5-c, 6-c, 7-a, 8-d, 9-d, 10-b, 11-a, 12-a.